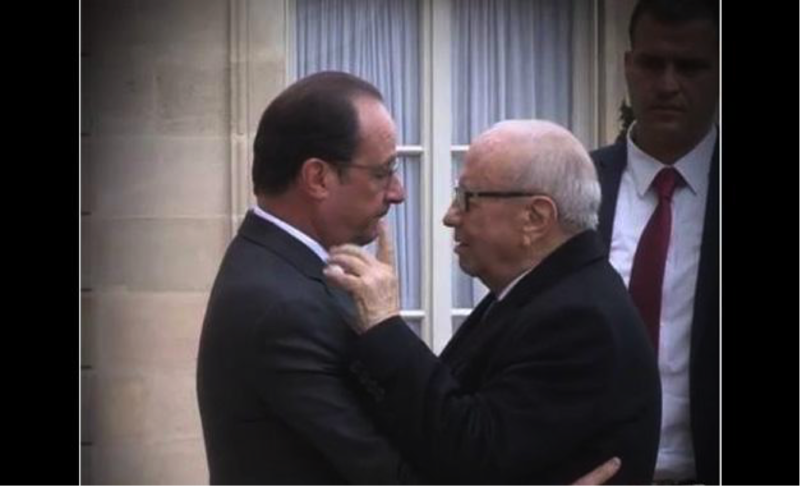 French President Francoise Hollande and Tunisian President Beji Caid Essebsi in commiseration embrace. 14 November 2015. Observing the aftermath of both the Paris and now latest Tunis attacks from the vantage point of the southern shores of the Mediterranean throws into sharp relief what is generalizable and interconnected about neoliberal national security. Much of the recent discussion entailing such comparison has revolved around the inequalities in “mournability” exposed by uneven political and media responses. However, a broader comparison may reveal even more profound and wide-reaching inequalities, as well as their “global” and “local” connections. Thinking through the Paris attack in relation to the ways in which counter-terror policies in Tunisia have shaped the contours of sociopolitical possibility following the 2011 uprising may shed light on how these connections contribute to the unequal production of (in)security. In other words, it may help us to understand how the accumulation of security for some may be enabled by, and even dependent upon, the production of insecurity for others. For many Tunisians, the horror that unfolded on the streets of Paris on November 13 had multiple dimensions. In addition to that of human tragedy, there was the personal—the fact that so many Tunisians have family members and friends who live in or regularly visit the city. There were the frantic moments of panic before confirming loved ones were safe, and, in some cases, the shock of discovering that they were not. Yet for some Tunisians, the trauma also took on a more political dimension. Photos of President Beji Caid Essebsi in a cordial, commiserating embrace with President Francois Hollande of France, Tunisia’s former colonizer, provoked cynical reactions. The photos of Essebsi’s visit were released after news had broken that a gruesome terrorist attack, in which a sixteen-year-old shepherd, Mabrouk Soltani, was beheaded, had occurred on Tunisian soil hours before the Paris attacks. Though an attempt was made to correct the initial underwhelming official response—the Interior Minister visited the site of the shepherd’s murder in the poor and historically marginalized governorate of Sidi Bouzid—the damage was already done. The minister’s visit was met by angry protests, with Soltani’s family demanding to know why it had taken until Saturday afternoon for government authorities to secure the area. As Essebi’s Paris visit demonstrates, the lines and gestures of the global memorial performance are now well-rehearsed by state actors on both sides of the Mediterranean, as well as further abroad. There was the Charlie Hebdo “anti-terror rally” in Paris in January 2015, followed by a similarly staged rally in “solidarity” with the European tourists targeted in the March 2015 Bardo Museum attack in Tunis, and then again most recently following the summer attack on tourists at the Sousse beach resort. Some have pointed to a glaring absence of global, and sometimes even domestic, government solidarity with Tunisia’s own victims of political violence. In addition to Soltani and the thirteen presidential guards killed in recent attacks, there have been sustained attacks across Tunisia’s interior and border regions over the past several years, which have claimed the lives of dozens of Tunisian soldiers, mostly conscripted from the country’s poor and neglected communities. Crucially, there are also the hundreds of victims of state violence from the 2010-2011 uprising against the western-backed rule of Ben Ali, whose “bodies…both vulnerable and demanding” were vital to establishing Tunisia’s current political and institutional order, but who have yet to receive their own global performance of commemoration. Focusing in on the way power operates at the ontological level may enable us to ask, and perhaps even answer and act upon, deeper questions not only regarding disparities in mournability, but also the economy of distinctions made between those lives deemed worth securing, and those viewed as perpetually threatening and expendable. Examining the interface between political and legal structures in relation to the production, distribution, and consumption of resources, such an approach shines light on the intimate relations between security, power and wealth. It also enables us to think through the relationship between security and racialization, a form of power forged through slavery and colonial rule that operates, as elaborated by Ebony Coletu, to “exploi[t] labour, justif[y] degraded forms of citizenship, and mar[k] boundaries of humanness,” in a way that responds to the needs of capital. Perhaps because of its links to the more tangible practices of security, political economy approaches to security tend to focus on consumption, or the mobilization of state resources and private capital in a way that enables the creation of new markets and capital flows in the global (in)security market. Such analyses generally entail a dizzying array of shocking statistics—the trillions spent on the “war on terror”; billion-dollar weapons deals signed by “merchants of death” and a range of repressive governments; the amount of money invested in military research and development; and so on. Most recently, there were the macabre statistics showing a leap in stock prices for weapons manufacturers in the aftermath of the Paris attacks, reinforcing the notion that (in)security is profitable, at least for some. In addition to its impact on civil liberties, the counter-terror response has facilitated the further militarization of security forces, as well as a program of mass incarceration targeting largely poor, or “surplus populations.” Over one hundred thousand people, or one percent of the Tunisian population, were arrested in the seven months following the Bardo attacks. In the aftermath of the recent attacks on security forces, there have been numerous aggressive raids, arbitrary searches and house arrests. The government has announced that an additional 6,000 security agents would be recruited beginning in 2016, and an additional 500 million dinars have been earmarked in the government’s proposed budget for the “fight against terrorism.” Though it claims a commitment to reducing “insecurity,” Tunisia’s standard counter-terror response has funnelled resources away from state projects that might actually enable a more equitable distribution of security. In the aftermath of the Charlie Hebdo attacks in Paris, the French government passed similarly intrusive anti-terror legislation criticized by many activists as France’s “Patriot Act.” Under the new law, a “range of motives [can] be invoked to engage in intelligence collection include[ing] industrial and scientific espionage” as well as “monitoring social movements.” In response to the recent attacks, Holland evoked racialized tropes of “our values” to justify more violence abroad, as well as a range of legislative measures designed to enable targeted structural and institutional violence at home. Hollande has also vowed to increase the allocation of state resources spent on policing and carceral technologies, suggesting there would be five thousand more police and soldiers on the payroll by 2017, 1000 more border staff (presumably to keep out refugees, as well as manage the promised increase in “expulsion” of citizens with dual nationality deemed “threatening” to the state), and 2500 new prison staff. Less obvious are the mechanisms by which widespread public consumption of affective security discourses enables this channeling of resources towards (neo)colonial interventions and technologies of discipline and control in a way bound to (re)produce the inequalities of (in)security. When thinking through the production of (in)security, we may ask what kinds of labor practices get reinforced through counter-terror responses. There is the labor of undocumented workers and other vulnerable communities that gets driven further underground by the enhanced policing of the counter-terror response, which exacerbates the insecurities and anxieties of those already living on society’s margins. Further exclusion from public and economic spheres contributes to the downward spiral of wages and increased opportunities for exploitation and surplus extraction. The militarized counter-terror response may also reinforce unspoken linkages between the “informal” and “formal” economies. As with other aspects of the economy, neoliberal forms of security also increasingly entail a shift of responsibility for well-being away from the state. Along with marketization, the production of security entails a process of individualization. Now everyone, especially the most vulnerable among us who feel least empowered to challenge dominant modes of power, is expected to become her/his own policeman, regulating her/his own communities, watching over her/himself, as well as over one another. Atomization becomes a key mode of national security governance, facilitating social and political control. The geography of uneven security illuminates the segregation of public space in cosmopolitan cities like Paris, established through racialized security and reinforced by the practices of capital. Through what David Harvey describes as the “mobilization of the spectacle (and splendor)”, consumption in the wealthy city center works “to mask and disguise the fundamentals” of both class and race relations in public space. The state-private nexus ensures the expansive and speculative nature of the national security state, with constantly expanding “borderlands”—the interstices where marginal citizen identities are situated. Though the “liberal state” derives its legitimacy from claims to blind justice, the law itself often functions to institutionalize an unequal distribution of (in)security, whether through differential sentencing or the delineation of criminality that only effects specific communities. Likewise, in times of “crisis,” when citizens are asked to accept, in the words of Hollande, a “temporary restriction on our freedoms,” not all of society is expected to bear the brunt of circumscribed liberty equally. Yet similar to other colonial powers, France honed its “state of emergency” practices in its colonies. First introduced into law on May 3, 1955, the “state of emergency” (distinct from a “state of siege,” which entails martial law) was designed to facilitate within the framework of the law and civilian governance, France’s violent repression of the Algerian independence movement. These practices would soon return home to be deployed against colonial diasporas within the metropole. In a gruesome display of naked force by the French security apparatuses, hundreds of Algerians were murdered—with many bodies dumped in the Seine—for their defiance of the state of emergency in a brave act of peaceful protest on October 17, 1961. The state of emergency, like the sovereign’s other national security prerogatives, has often functioned to depoliticize and thereby place limits upon the kinds of political claims that can be made against the state: from demands for independence and recognition (and redress) for past crimes and suffering inflicted on colonial subjects, to pleas for an end to the structural exclusions and institutional racism experienced by France’s post-colonial communities, les indigenes. The legislative, administrative and policing practices through which colonial France guaranteed an unequal distribution of security, in particular those associated with the “state of emergency,” would have long-lasting implications for Tunisia, a French Protectorate from 1881-1956. From the 1978 “Black September” crackdown on trade unionists across the country, to its recent invocation by the government to quell labor strikes in Gabes, the post-colonial Tunisian state has often relied upon the “state of emergency” as a useful tool for managing problematic populations. Pray for Paris, All Lives Matter, or Black Lives Matter? In the face of an overwhelming focus of the media and political establishments on the French attack, the impulse to stress the importance of all life by reminding of the suffering of Yemenis, Palestinians, Nigerians, Syrians, Kenyans, Tunisians and other (deliberately) underreported victims of violence across the globe is certainly understandable. Yet, in pointing out the inequalities of mournability, we are also reminded to think critically about the potential implications that the conflation of human suffering may have on our capacity to develop sound political analysis in a way that enables action. While recognizing the horror of each instance of suffering, such analysis requires that we distinguish between different forms of political violence (state and non-state, colonial, imperial, and others), but also make explicit the overlaps, imbrications and interconnections where they exist. In this sense, there are certain lives that should be highlighted over others, precisely because they have been systematically and structurally undervalued for so long. This, I believe, is a central point made by the Black Lives Matter movement. Taking it seriously—in Tunisia and France—requires more than an acknowledgement of the inequalities of mourning and differentially produced and distributed (in)security. It requires an acknowledgement of the historical dimensions of this inequality, and a politics of redistribution to redress it. Dr. Corinna Mullin is currently based in Tunisia, where she is Visiting Assistant Professor in International Relations at the University of Tunis. Prior to this, she held a two-year Lectureship in Comparative and International Politics of the Middle East in the Politics and International Studies department at SOAS, University of London, where she also spent one year as an Economic and Social Research Council (ESRC) Postdoctoral Research Fellow. She holds a PhD in International Relations from the London School of Economics (LSE). In addition to her academic publications, Dr Mullin has contributed analysis to a wide-range of online media outlets, including: Jadaliyya, Sada, Al Jazeera, Huffington Post, Foreign Policy in Focus and openDemocracy.